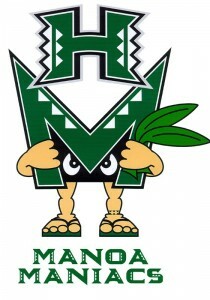 HONOLULU – Beginning with the 2014-15 University of Hawai‘i men’s basketball season, Manoa Maniacs seating sections will be adjusted slightly to allow the Maniac’s to continue their growth, collaboration, and impact at the games. Over the last two men’s basketball seasons, the Maniacs have seen their average attendance numbers double from roughly 200 per game at the start of the 2012-13 season to more than 400 per game at the end of the 2013-14 season. Under the Maniac’s new plan, the current three student sections, presently behind the North/West basket, will shift over one section, thereby vacating the students presently in Section JJ and moving them to Section E. The paying fans in Section E will be relocated. All affected fans in Section E have been notified of their relocation by letter and each will be called personally. Once season ticket renewals are completed, the process to find all Section E ticket holders new seats will begin. They will be given top priority, and will have all open seats to choose from, including all of seats in Section JJ vacated by the students. This move will only affect the men’s basketball seating. More impactful than the Maniac’s increase in size has been their increase in spirit. Highlighted by their theme nights accompanied by coordinated cheers, music, and costumes, the Maniacs’ have exhibited levels of organization and collaboration that match other schools with strong student body cheering sections. The Maniacs have drafted new procedural rules and policies relative to: recruitment, training, planning, marketing, communications, fulfillment, game week/day procedures, and even detailed instruction on cheers, songs, and dances. Finally they have increased their budget allocated for on-campus student promotions from $5,000 in 2012-13 and zero in 2013-14, to $20,000 in 2014-15.